One of the most crucial areas where labeling plays an important role is in the pharmaceutical industry. It plays the role of identifying what the product is and its function. Labeling in the pharmaceutical industry helps in different manners like the dosing instructions, magnified & expiry date, ingredients list and many more. Most of the medicine of liquid form is been stored in bottles that should contain with the correct information. The bottles are been labeled with help of different bottle labeling machine like position bottle labeling machine, wrap around labeling machine and other machine depending on the requirement for labeling the bottle of different shapes. With labeling, it is also important to get high-quality labeling of the products as poor quality can make mistakes and can cause the fault in the products. Different types of bottle labeling machine are been used for labeling of pharmaceutical products like dry syrup powder labeling, & IV Bottle Packaging Unit Labellers are also been used. Labeling machines for bottles like front & back labeling machine, wrap around labeling machine, self-adhesive labeling machine is been used depending upon the requirement and the type of product. This labeling machine helps to label bottles of different size and shapes. Injectable units are also been used in the pharmaceutical industry. These injectable units are been labeled with the help of ampoules and vial sticker labeler machine. This machine is specially been utilized for labeling round ampoules, vials, and many other round shaped objects. As most of the injectable units require a transparent label, this machine incorporates with specialized mechanical and electronic system that helps for applying transparent / no look labels on injections and vials, at a high speed by an optional label sensing system. Hence it is vital to choose a high-quality labeling machine for the pharmaceutical industry. The labeling should be clear and must include all the relevant information related to the medicine. 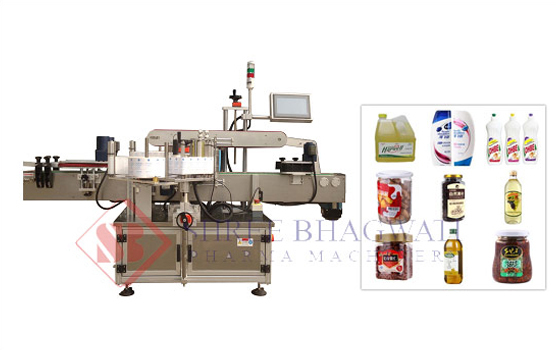 Bhagwati Labeling provides different types of labeling machine to pharmaceutical as well as different industries that will minimize mistakes and improve the consistency of your product range. We offer different range of machines that can handle different types of containers as well as surfaces. Our different labeling machines include top labeling machine, double side labeling machine, induction cap sealing machine, vial sticker labeling machine, single side labeling machine, shrink sleeve applicator and many more products. For more information about the labeling of products contact us today & get high-quality labeling machine for your product.